15 minutes ready if I am online with 30 Days guaranteed! I am Sys. Admin from 1996 and seriously full timer vps selling. You will get best support both from me and my team. I will setup 4GB RAM, 40GB SSD windows VPS for 30 days. This is not google cloud or aws. I bought Dedicated Server and set it up manually. You may googling, SSD is 8 times more faster then HDD. seoclerks minimum for a month, or else I will reject it. 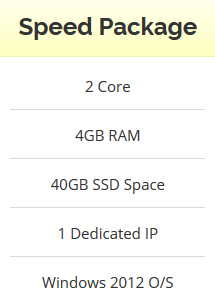 Windows VPS Renewable - 4GB RAM - 2 Core - 40GB SSD - Unlimited Bandwidth is ranked 5 out of 5. Based on 33 user reviews.